The history of the 20th century is a long and bloody one, punctuated with horrific conflicts and inspiring hopes. In this course, we will explore some of the big themes of the past century through literature and history, as we examine the world we live in today, how it came to be this way, and how we can, with our actions, interpret and change it. For our opening mini-project, we will explore Joseph Campbell's idea of the "Hero's Journey," or monomyth. We will use his ideas and frameworks as a starting point for explorations both inward, into our own journeys, and outward, into the journeys of others as expressed in literature, movies, and other art forms. We will cross the threshold, visit the abyss, and hopefully emerge victorious from the experience. 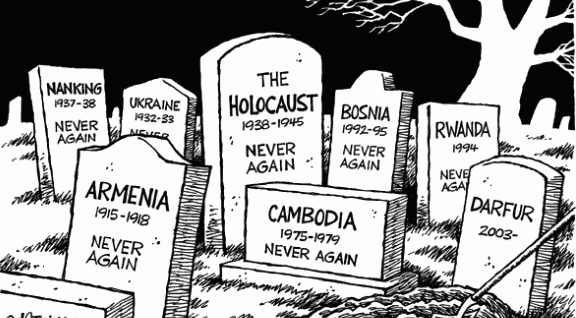 After the Holocaust, the world said emphatically, "Never again!" Despite this initial resolve, genocides continued throughout the 20th Century and into the 21st. In the ultimate crime against humanity, the extermination of an entire group of people because of who they are, there are many lessons to be learned. In this project, we will be exploring the darkest aspects of human behavior, and those points of light who resisted in the face of enormous oppression and danger. We will aim to learn why we are capable of these acts, what the warning signs are, and hopefully, how to prevent them from happening again. Words have power. Power to describe, to move, to change, to inspire, to obfuscate, to wound, to heal. No art form is so centered on the power of words as poetry. In our final project together, we will explore the jungles and deserts of poets, learning to read and interpret what is often seen as a mystifying tangle of syllables. Then we will turn our hands to expressing our own truths through poetry and performance, bringing to our community words to carry with them beyond the walls of our school.